Price is $1800 each,.. these are REAL Imports! please read over our site. About me: I was raised with German Shepherds as a kid, and my dad, his parents being German , only wanted the best. He recognized the purity and higher standards of the German breeds vs. the American line. Our dogs were from titled imports and very costly. I loved this loyal breed so much I decided I wanted to be a German Shepherd breeder. Starting small, I only had one litter from 1984 to 1987. We then moved from Connecticut, where I grew up, to upstate New York in 1987, where we had 10 acres. I accumulated horses, goats, and of course, more German Shepherds. I have retired and now my daughter and granddaughter continue this business of Importing top Quality German Shepherds. Don’t forget to ask for Ariel or Emma. What does the name Berg Quella mean? Here’s the backstory our our name. In 1990, I joined a United Schutzhund Clubs of America club and drove an hour and a half each way every Saturday to learn. I started bringing my dogs for training—tracking, obedience, and protection. My instructor took me under his wing and gave me a German dog magazine, Deutsche Schäferhunde. I set out to learn German so I could read it! Within weeks, I was calling Germany to inquire about dogs for sale. I imported my real first Import in 1992 and it was then that my instructor told me I needed to name my kennel. Because I lived up on a mountain with several natural springs, I choose the name Berg Quella, which means “Mountain Springs”. I even had that kennel name registered in Germany. I kept and raised some puppies, giving them this kennel name. I moved to Florida in 1999 and brought my best male and female and continue to this day to strive to breed a German Shepherd that Max von Stephanitz, the founder of the German Shepherd breed, would approve of. Since registering Berg Quella Kennel in Florida, we have bred and sold hundreds of German Shepherds to happy owners! I have been to Europe twice and regularly Import my dogs from there. 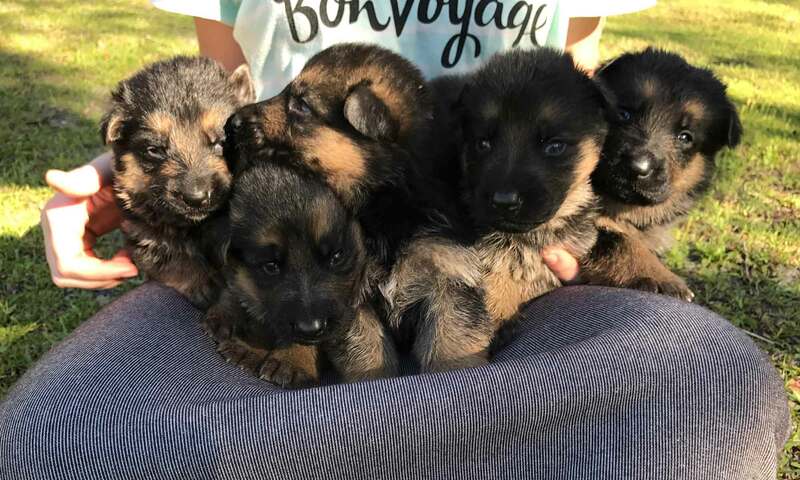 Please look through our website to see our available German Shepherd puppies for sale, find answers to frequently asked questions about German Shepherds, or check out our blog. Of course, if you have any questions or are interested in buying a quality German Shepherd puppy, please contact us. Here’s a list of some of our beautiful Imports. Since 1994, Linda Strand at Berg Quella Kennel has focused on providing quality German Shepherd puppies for pet, work, or for show. Based in Central Florida, we breed and raise our puppies in the home, from German Import lines. We offer healthy German Shepherds with good hips in these colors: Black Red & Black and Tan.